Powers/Abilities: Buck possessed "belief defyin' strength" and "tungsten hard skin". He once used a experimental growth serum which turned him into the gigantic "Buck Goliath". While working with the Patriot, he wore a winged costume allowing him to fly. He also experimented with wearing some sort of wrist apparatus which generated lightning bolts. During his brief resurrection, the legendary Ruby Begonia brought him back to life, and allowed him to generate green smoke, the sound of drums tolling doom, and a ghost like double (soul self?) which could possess others and make them do his bidding. 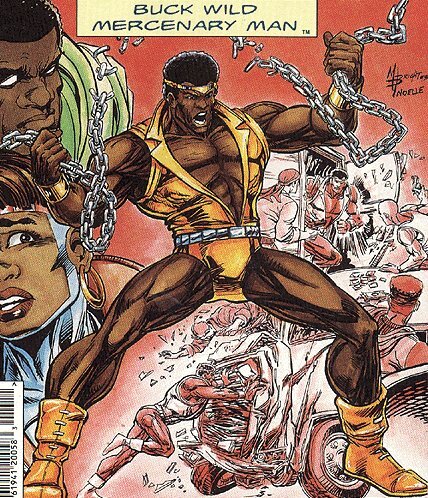 Comments: Described as "a thinly-veiled Luke Cage parody through which the treatment of black characters in comics was explored".